GoCardless is a UK based Direct Debit provider. The Direct debit payments in Australia can be processed by GoCardless. How direct debit payments are processed in Zoho Subscriptions with GoCardless? As of now, GoCardless is supported in the European countries and Australia via BACS and SEPA(like ACH in the US). To accept direct debit payments with GoCardless you must have a GBP/Euro bank account connected with your GoCardless account. Also, this integration supports transaction only in Pound Sterling (GBP) and Euro (EUR). Note that, you have to register for SEPA, in order to accept payments in Euro. Contact GoCardless to register for SEPA. The minimum transaction amount is £1 and the maximum transaction amount is £5,000. You can contact GoCardless to increase the limit. When a direct debit payment is initiated, Zoho Subscriptions requests GoCardless which in turn contacts the customer’s bank to allow charging the customer’s account. This whole process will take 3-5 business days. Before, charging the customer’s bank account, your customer has to authorize your withdrawal of funds using a Direct Debit Mandate. Zoho Subscriptions will generate a mandate for a particular customer during the checkout process which customer can authorize by enabling the checkbox Use this Direct Debit Mandate for future transactions. Learn more about Direct Debit Mandate. Once you’ve understood how direct debit works in GoCardless, let’s start with setting up the GoCardless gateway. Click the Gear icon and select Integrations. Select Online Payments and click the Setup GoCardless button under GoCardless. In the following screen, you can create a new GoCardless account by clicking on the Sign Up button at the bottom. Enter your name, organisation name, email, and password and click Create & Connect your GoCardless account. You will then receive a verification email from GoCardless to verify your account. To verify your account, you have to sign in to your GoCardless account using the link provided in the verification email. In the following page, fill in your company information and the bank account details you would like to send/receive the payments. If you’ve been already GoCardless outside Zoho Subscriptions, you can directly connect your account with Zoho Subscriptions without any hassle. In the following screen, enter your GoCardless registered email and password and click Connect your GoCardless account. Once that’s done, Zoho Subscriptions will send/receive payments to the bank account associated with this account. Once you’ve configured the GoCardless account, follow the steps below to enable Direct Debit payment for a customer. 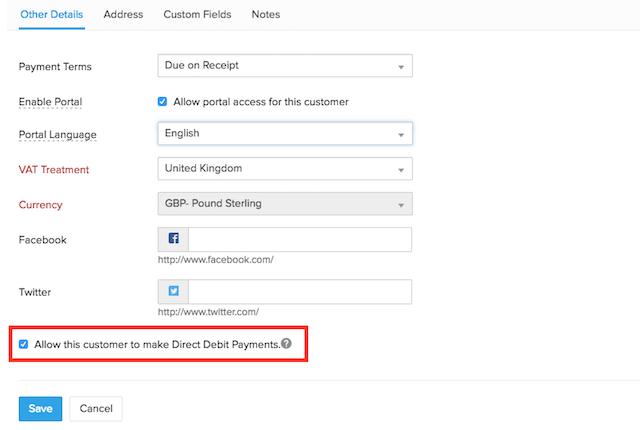 If your customer wants to pay via Direct Debit payments, you have to enable the checkbox Allow this customer to make Direct Debit Payments in the customer Edit screen. You can enable Direct Debit payment for a subscription only after creating it. After creating the subscription, your customer has to login to their portal, select the respective subscription’s invoice and pay using GoCardless by authorizing the mandate. Detailed instruction listed below. Request your customer to do the following. Login to their customer portal. In the Invoices module, select the respective subscription’s invoice that to which they want to enable the Direct Debit payment for and click Pay Now button. In the following page, enable the checkbox Use this Direct Debit mandate for future transactions option. This checkbox acts as the mandate for customers. Once enabled, click PROCEED TO PAYMENT button. On clicking, they’ll be redirected to the GoCardless payment page where they need to enter their bank account details and initiate the Direct Debit process. If your customer wants to convert his/her subscriptions from offline to online direct debit subscription, you can use the Request Payment Method to get the bank account details from your customers. Go to the Customers module and select the customer for whom you want to add the bank account details. Select the More button at the top-right and click on Request Payment Method. Once done, Zoho Subscriptions will send an email with your organization details and they can add their bank account using the link provided in the email. Once the customer adds their bank account, it will reflect inside Zoho Subscriptions. Once card/bank account is successfully added, you have to manually associate the card to a subscription so that Zoho Subscriptions can automatically charge customer’s card on every renewal. Navigate to the Customers module and select the customer. Next, click on the subscription for which you want to associate the bank account with. In the subscriptions details page next, scroll down and click on the Associate Payment Options button and click Associate bank account. In the following screen, select the bank account using the radio button and click Save and Change to online button. If Save is selected, the bank account will be associated with the subscription but it will not be charged on renewals. The subscription will still be an offline subscription. If your customer wants to update their bank account, they can use their Customer Portal. Click here to know more. Once updated, it will reflect inside Zoho Subscriptions. When your bank account is updated, all your Direct Debit payments will be sent/received via this updated bank account. Login to your GoCardless account. Select Settings in the top-right corner and select Company info. In the following screen, click the Edit bank account button next to the tab Connect bank account. Enter the new bank account details and click Submit details button. In Zoho Subscriptions, with respect to Direct Debit payments, following email notifications will be sent to the customers. Learn more. To refund a payment received via GoCardless, it is recommended to refund two days after the payment is processed. This is to avoid refunding of any failed payments. Mandate sync in GoCardless allows you to fetch your customers’ mandate details from your GoCardless account to your Zoho Susbcriptions account. The primary email address of your customer in Zoho Subscriptions should match the email address of the customer in GoCardless. Mandates of two or more customers in Zoho Subscriptions with the same primary email address will not be fetched.